Skype announced Thursday that iOS and Android users in the U.S. and Western Europe can expect to start making group video calls from their smartphones and tablets in the coming week. The feature will allow users to hold conversations with up to 25 friends at once. Skype designed two new views for group video conferences: the first allows users to see one another in a grid, and it's designed for calls with a handful of people. A second active speaker view shows a big picture of the person talking by default, along with a small, scrollable row of other participants. In that view, users can also "pin" someone, so they can always see a large view of the most important person in the conversation for them. Users can change who they've pinned during the call, or remove the pin and go back to Skype's default mode of primarily showing the person talking. It's worth noting that this update doesn't just allow mobile to mobile group video calls, where everyone is staring at a smartphone or tablet. It also means that people who are out and about can still join a group call being held by friends who are all using desktop computers. 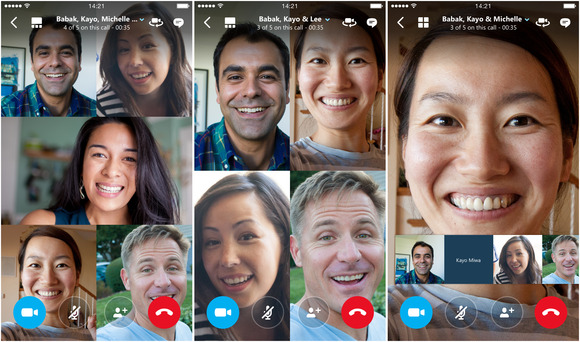 Adding group calling to Skype on mobile devices is important for Microsoft, as the company faces increased competition from services like Google Hangouts, which also offers group video calling across platforms, and often comes pre-installed on phones running Android. Users outside the U.S. and Western Europe can expect to see the new feature roll out in March.